Be it in the construction, mechanical engineering, or automotive supply industry, steel is used whenever possible. In steel applications, productivity and cost are often the primary focus. The push configuration of the TPS/i power source from Fronius supports users with improved system availability and optimized system costs. Whether it’s rolled, milled, or welded, steel is incredibly versatile thanks to the variety of alloys and can be machined with ease. And even more importantly, steel is abundantly available at a reasonable cost. All of these factors make steel the top choice of material, provided that weight, resistance to the weather and acids, and hygiene aren’t an issue in the application in question. Not every welding application is high-tech and high-end. With steel, you’re getting a material that’s straightforward, robust, and cost-effective. And the exact same characteristics apply when welding this material. 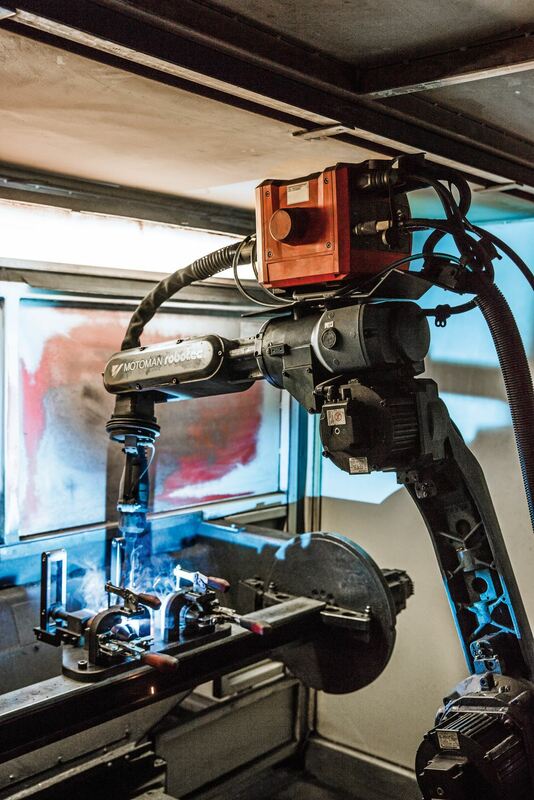 Gas metal arc welding is often used for steel, either in a manual or robot-controlled process. The push system is ideal for this application, and Fronius offers it as a configuration option for its flexible TPS/i welding platform. The push system has a simple design and is easy to use. It helps ensure high levels of system availability and optimizes system costs as far as procurement and operation are concerned. This is how it works: the motor in the wirefeeder feeds the wire forward through the hosepack and toward the welding torch. With the hosepack and welding torch also having been developed by Fronius, the system works flawlessly as a whole unit. 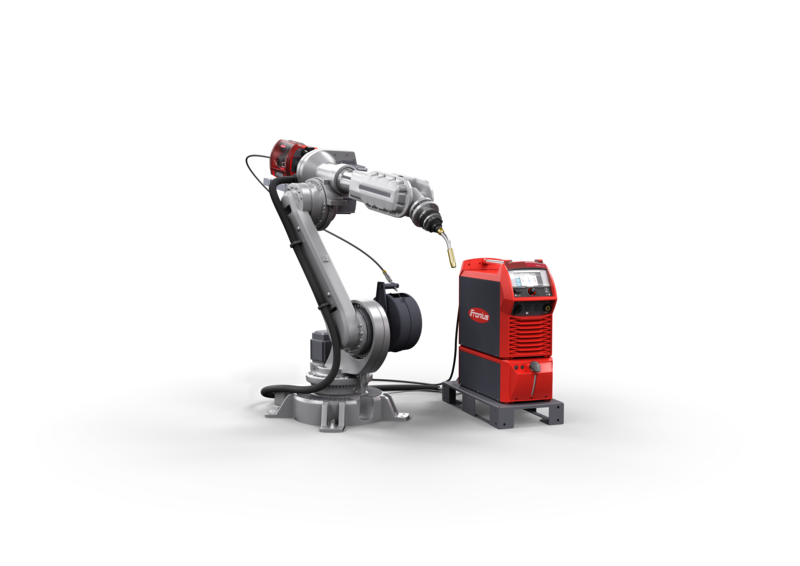 The welding torch doesn’t require a motor of its own, keeping it lightweight – a definite benefit for welders and robots alike. Less powerful robots are therefore required for automated applications, which reduces the overall system costs even further. 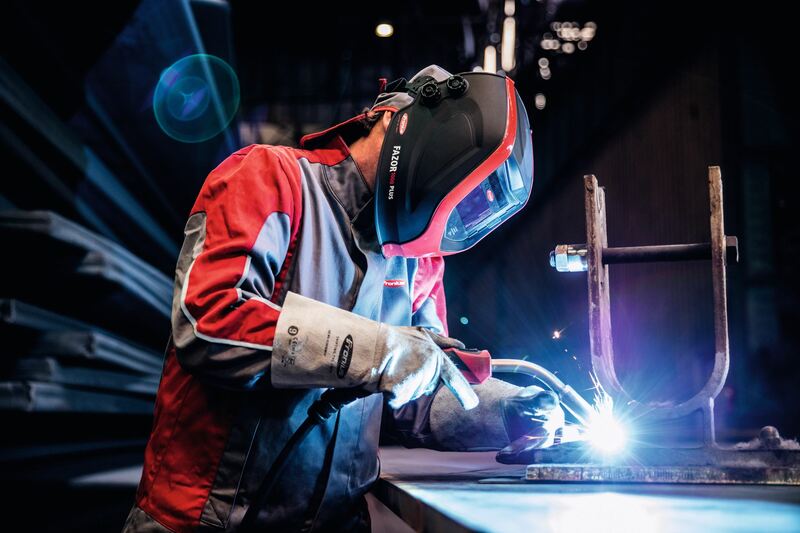 With the push system, Fronius has once again focused its attention on the consistently high quality of welding results. 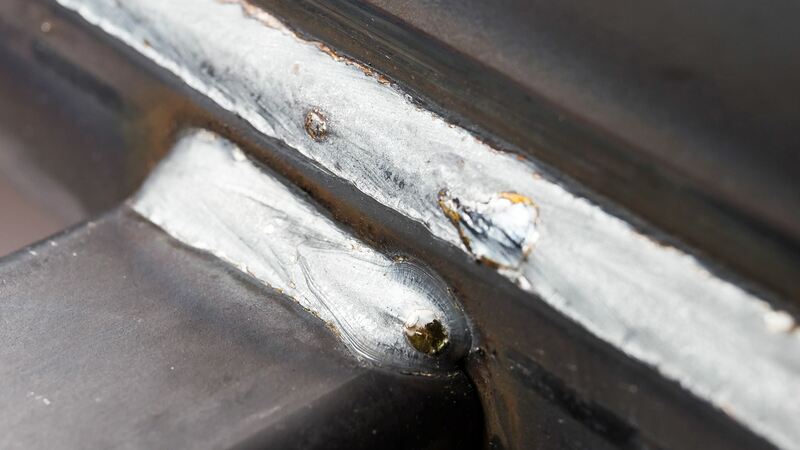 The Low Spatter Control (LSC) and Pulse Multi Control (PMC) welding packages include assistance systems to help welders achieve high-quality seams even when conditions are tough. Both packages have a penetration stabilizer, and welders receive an additional benefit with the PMC package in the form of an arc length stabilizer. These assistance systems are particularly important when component tolerances cannot be complied with, such as when joins become larger or material thicknesses vary. The stable arc also makes it possible to achieve high welding speeds. Many suppliers within the automotive industry even manage to increase their productivity by around 20% with PMC. Overall, the push system enables users to achieve optimum weld seams even when budgets are tight and conditions are far from ideal. 1.1 All deliveries and other services effected by ourselves, and all payments made to us, shall be exclusively governed by these Terms of Delivery and Payment. Insofar as applicable provisions may be found to be missing therefrom, the General Terms of Delivery of the Austrian Electrical and Electronic Industries shall apply in a subsidiary manner; in all other regards, Austrian laws and regulations shall apply. If any business terms of the Ordering Party’s are at variance with these General Terms of Delivery and Payment, we shall only be bound by such divergent terms if we have expressly recognised the same by letter or by telefax. 1.2 In taking delivery of the goods and/or service, the Ordering Party acknowledges the exclusive applicability of our Terms of Delivery and Payment. 2.1 Our offers are without engagement and subject to alteration, unless the offer makes express mention of a period of engagement. Documents pertaining to our offers – such as drawings, illustrations, samples and patterns, and dimensional, weight, performance and consumption data – contain or themselves constitute only approximate data and are not deemed to be specially agreed characteristics unless otherwise provided. We retain the right to effect modifications for engineering reasons. 2.2 We reserve the proprietary rights and copyright to all cost estimates, drawings and other documents; these may neither be disclosed to any third party nor used for the purposes of any third party. Acceptance of an order, and any undertakings or supplementary agreements made by our employees, as well as amendments and alterations of any kind, shall not be binding upon us until we have issued written confirmation by letter, telefax or e-mail. 4.1 Prices are always the list prices valid on the date of delivery. They are ex-works prices (EXW), exclusive of packaging, insurance, loading at the factory and value-added tax; the packaging will not be taken back. 4.2 Payments are to be made net cash, without any deduction and free of charges, within 30 days of the invoice date. It shall be for us to decide which claims or partial claims of the Ordering Party’s may be offset against such payments. 4.3 If any changes in order execution are necessitated by circumstances where risk is borne by the Ordering Party, then this latter shall bear all additional costs thereby incurred. 4.4 If the payment period is exceeded, we shall be entitled to charge default interest at a rate of ten percentage points above the applicable base rate announced by the Austrian National Bank, plus the collection costs, such amounts to total at least 12% p.a. of the overall claim. This is without prejudice to any further consequences of default in payment. 4.5 It is inadmissible for the Ordering Party to withhold payments or to offset these against counter-claims which are contested by ourselves. 4.6 Where the Ordering Party holds claims against ourselves, we are entitled to offset these against our own claims against the Ordering Party, at any time. 4.7 For services performed under contracts for work and materials (installation, repairs, maintenance and other such work), we shall charge the hourly rates and materials-prices applicable at the time of completion, plus our applicable surcharges for any overtime, night-time, Sunday and public-holiday working; travel and waiting times are counted as working hours. Travel expenses and daily and overnight allowances will be invoiced separately. 5.1 The delivery period commences with the mailing of the order confirmation note, while the performance period for installation, maintenance or repair work commences when the equipment is handed over. On no account, however, shall the delivery or performance period start to elapse sooner than 14 days after the time when the Ordering Party has furnished us with the documents (e.g. engineering drawings, plans etc), permits or approvals which it is responsible for procuring, or when it has made the agreed pre-payment. The delivery or performance deadline is deemed to have been met if we have notified the Ordering Party prior to such deadline of our readiness to deliver or perform; in cases where a special agreement obliges us to dispatch or deliver, the delivery or performance deadline shall be deemed to have been met if the object of delivery or performance has left our factory prior to such deadline. 5.2 Delivery or performance periods are extended for the duration of any unforeseen impediments lying outside our sphere of influence, such as stoppages, major personnel outages, unlawful strikes, delays in supplies of essential raw materials or components or the like, as well as by circumstances where risk is borne by the Ordering Party, to the extent that these impediments and/or circumstances are of material relevance to the failure to meet the deadline. Impediments and/or circumstances of this nature also annul the consequences of a default for which we would otherwise be liable, for the duration of such impediments; any contractual penalty obligations which may have been agreed for specific instances shall entirely cease to apply. Immediate notification is to be given of the beginning and end of such impediments. We are entitled to terminate the contract, in whole or in part, if such impediments should occur. In this case, unless the Ordering Party proves gross negligence on our part, damages claims from the Ordering Party shall be inadmissible. 5.3 If agreed delivery or performance deadlines, or deadlines that have been extended in accordance with 5.2 above, are exceeded by more than four weeks, the Ordering Party shall be entitled to terminate the contract, having granted us at least 14 days’ extra time by notice given to us in a registered letter. Unless the Ordering Party proves gross negligence on our part, damages claims from the Ordering Party shall be inadmissible in this case. 5.4 If the Ordering Party incurs a loss from a delay for which we are liable, then it shall be entitled to compensation amounting to 0.5% per whole week - up to a maximum of 5% - of the value of that part of the delivery which cannot be used in time or for its intended purpose as a result of the delay. For other services, the compensation shall be 5% of the remuneration. Any damages claims going beyond the above shall be inadmissible, as shall claims for damages in consequence of delays on the part of our suppliers, unless gross negligence is proven on our part. 5.5 In cases where we have undertaken to effect shipping, the mode and route of shipping shall be for us to decide. Goods are always shipped at the Ordering Party’s risk and expense. We shall only be liable for damage if gross negligence is proven on our part. We shall only take out transport / breakage insurance by order and for the account of the Ordering Party. 5.6 We are entitled to effect part-deliveries. 5.7 Our compliance with the delivery period shall be contingent upon the Ordering Party having fulfilled its contractual obligations in all pending, still-to-be-completed business transactions. 5.8 If shipping is delayed due to circumstances where risk is borne by the Ordering Party, then this latter shall bear all resulting additional costs, such as those for storage at our factory, but with a minimum monthly charge of 0.5% of the invoice amount. In such a case we shall also be entitled to grant the Ordering Party a grace period of at most 14 days, and if this period should expire to no avail, we shall then be entitled, at our own discretion, either to make alternative arrangements regarding the article(s) to be delivered and to effect delivery to the Ordering Party within a suitably extended period of time, or to terminate the contract and claim damages for breach of contract. In this latter case, we are entitled, without having to furnish any particular proof, to require 10% of the remuneration for the intended delivery as indemnification. Where appropriately substantiated, we can also claim compensation for any damage over and above this amount. 5.9 In the case of goods ordered on call, or ordered for production with no shipping instructions, delivery must be taken within three months. If this time limit elapses unused, then 5.8 shall apply analogously. 5.10 For services performed under contracts for work and materials (4.7), the Ordering Party is to provide us with the necessary equipment and auxiliary materials (e.g. winches, rails, electricity etc.) in good time and at no charge, even if installation is included in the price (4.1) or if a flat-rate price has been agreed for this. Any works needing to be carried out by the Ordering Party preparatory to installation, e.g. building work, must be completed prior to the arrival of our installation technicians. Furthermore, the Ordering Party must take all safety precautions needed for the protection of persons and property. We shall not accept liability for the ancillary personnel, equipment and auxiliary materials which may be placed at our disposal unless gross negligence is proven on our part. 6.1 Risk shall pass to the Ordering Party as soon as the articles to be delivered, or the articles on which we have performed maintenance, repair or other work, have left our factory. The same shall also apply to part-deliveries or in cases where we have undertaken to bear the shipping charges or to perform delivery, setting-up, assembly, installation or other similar services. If the maintenance, repair or other work is carried out in the domain of the Ordering Party, then risk shall pass to this latter as soon as it has received notification that the work in question has been completed. 6.2 If there is any delay in dispatching or delivering the shipment for reasons for which we are not liable, the risk shall pass to the Ordering Party as soon as it has been notified that the consignment is ready for delivery. 7.1 We shall retain title to the article(s) delivered until our purchase-price claims, and all other claims that we have – on whatever legal grounds – against the Ordering Party, have been settled in full. 7.2 The Ordering Party is only permitted to re-sell the article delivered – even if this has been joined to other items or subjected to processing – in the course of its company’s regular business operations. However, this permission is precluded if the resulting claims are assigned to third parties or are the subject of an assignment prohibition, or if the Ordering Party is insolvent or in default with the performance of its contractual obligations. No other manner of disposition whatever is permitted to the Ordering Party. In the event of distrainment, confiscation or other disposition by third parties, the Ordering Party is to notify us hereof immediately. Our legal expenses incurred in connection with the enforcement of our title are to be borne by the Ordering Party. 7.3 The Ordering Party assigns to us even now its claims and other rights from the re-sale, rental or leasing of the article delivered, even if this latter has been joined together with other items or subjected to processing; the Ordering Party shall make an entry to this effect in its books. If the article delivered is sold or placed into the hands of a third party for such party’s use together with other items (regardless of whether or not it has been joined to any such items or subjected to processing), then the receivables claim shall only be assigned up to the amount of the purchase price owed to ourselves. This is without prejudice to any further damages claims. 7.4 The Ordering Party is only entitled to collect the claims and to assert the other rights to the extent that it has met its payment obligations towards us and is not insolvent.7.5 If the Ordering Party should act contrary to the terms of the contract – in particular by being in arrears with payment or with any other contractual obligation, and/or by being insolvent – we shall be entitled, at our own discretion, either to terminate the contract without granting any grace period or, while leaving the contract in force, to take back the article delivered or to forbid it to be used. We shall also be entitled to sell the taken-back article in the open market; after deduction of a handling fee of 10% of the proceeds thus realised, the remainder will be debited from the total of our outstanding claims against the Ordering Party. Pending return of the article in the event of our terminating the contract, we shall charge the Ordering Party a usage fee of 5% of the original value of the article, unless the actual diminution in its value is even greater. 8.1 We give no warranty for ordinary deviations in size, weight or quality (or as tolerated by ÖNORM, EN or DIN standards), and also no warranty for information given regarding the suitability of the article(s) to be delivered for the purpose contemplated by the Ordering Party, or for any other particular purpose. 8.2 Although we warrant the correctness of our processing instructions, user/operating manuals and customer advisory service, compliance with statutory or other regulations when using the articles delivered, and the testing of these articles for the purpose envisaged, shall remain the sole responsibility of the Ordering Party. We shall only be answerable for any instructions differing from our written processing instructions and user/operating manuals if we expressively previously confirmed these deviations to the Ordering Party in writing, either by letter, telefax or e-mail. 8.3 Articles or services supplied must be inspected by the Ordering Party immediately after delivery has been taken of them. Any defects must be reported to us immediately upon being discovered, in a written notice sent by letter, telefax or e-mail quoting the number and date of the order confirmation note, of the delivery note or of the invoice, and the serial and commission numbers. If the Ordering Party omits to make this immediate notification, it may no longer assert any warranty claims or claims for compensatory damages on account either of the defect itself or of any misapprehension as to whether the delivery or service was free of defects. The notice must set out which delivered items or supplied services are affected by the defects, what the defects consist of in detail, and under what concomitant circumstances these defects occurred. Every single defect must be exactly described. Any costs which we incur as a result of unjustified notices or notices that are otherwise at variance with the conditions of use are to be refunded to us by the Ordering Party. 8.4 In the case of corrective and preventive maintenance work, our warranty shall be limited to the services actually rendered. We shall only warrant correct functioning of an installation, machine, Software or the like whose components were not all supplied by ourselves if we provable have undertaken – despite the provision of certain components by the Ordering Party or by third parties – to manufacture the installation (or machine etc.) as a whole, and if the faulty functioning in question is not attributable to incorrect or incomplete information from the Ordering Party. 8.5 Unless otherwise agreed, the warranty period shall be 24 months. From the beginning of the 13th month of this period, however, our warranty shall be limited to making available, free of charge, the items needed for remedying the defects; from this time onwards, any warranty claims going beyond the above shall be inadmissible. This period limitation also applies to the supply of items deemed to be immovable and to work on items which are, or are deemed to be, immovable. The warranty period shall start to elapse upon the passage of risk in accordance with Point 6. The Ordering Party must always prove that defects coming to light during the warranty period were already present at the time of the passage of risk. 8.6 In cases where we do give warranty, we shall – at our own discretion and within a reasonable period of at least 4 weeks’ duration – either exchange the defective article itself, or its defective components, for a defect-free article or defect-free components, or remedy the defect(s), or grant the Ordering Party a reasonable reduction in price, or (unless the defect in question is a minor one) cancel the contract. The warranty period is not prolonged by the exchange of the item or of parts or components belonging to the item. If, however, the remainder of the warranty period – including that part of the period during which our warranty is limited to free provision of the requisite materials in accordance with Point 8.5 – lasts for less than twelve months, then the warranty period for the exchanged items, parts or components shall be extended to twelve months. The items, parts or components thus exchanged shall become our property. We shall not refund the costs for any actual or attempted remedying of a defect by the Ordering Party or by any third party. 8.7 To the extent that is necessary and may reasonably be expected of the Ordering Party, the object of delivery or performance, or the defective part(s) thereof, are to be dispatched or shipped to us immediately at our request, at the Ordering Party’s risk and expense, failing which any and all warranty obligation on our part shall become void. 8.8 The Ordering Party is not entitled to withhold payments on account of warranty claims or other counter-claims not recognised by ourselves. 8.9 Warranty claims from the Ordering Party are excluded in cases where the installation, user and operating manuals provided by ourselves, or to be requested from us by the Ordering Party, have not been observed, or where the user has not been (fully) obligated to observe such instructions; if the installation work has not been performed properly and in accordance with the relevant Standards, and in particular if was not carried out by licensed contractors; if any corrective maintenance or other work has been performed on the object of delivery or performance without our consent; if it has been improperly operated or used, or operated despite its protective features being faulty, or taken out of the contract territory without our consent, or used contrary to our instructions or for purposes for which it is not intended; and, moreover, where defects are attributable to foreign object damage, chemical influences, overvoltage, the conduct of third parties or to force majeure; the same applies in respect of natural wear-and-tear. 8.10 Our warranty is also excluded in cases where we have been contracted to carry out repair-orders, to alter or modify used items, or to supply such items. 8.11. Finally all warranty claims shall be excluded if the Ordering Party installs third-party components or replacement parts in our delivery items or services provided by us which have not been expressly recommended by us prior thereto. 8.12. In addition to the rights of the Ordering Party in accordance with Point 8.6. regarding the delivery of inverters for photovoltaic systems the guarantee in accordance with the guarantee conditions of Fronius shall apply, available at https://www.fronius.com/en/photovoltaics/products/all-products/solutions/fronius-service-solutions/fronius-warranties/fronius-warranties. 9.1 We shall only accept unlimited liability for damage, of whatever kind, to the extent that the Ordering Party proves that we ourselves brought about this damage either knowingly and wilfully or grossly negligently. If the Ordering Party proves that we have caused damage in an ordinarily negligent manner, our obligation to indemnify shall be limited to the damage actually incurred, and, moreover, to a maximum overall amount not exceeding the total order value. Furthermore, claims of this type may only be enforced at law if asserted within six months of the damage in question becoming known. 9.2 In the event that we are taken to law by a third party where we have produced and delivered in accordance with the drawings, designs, models or other documents provided by the Ordering Party, the Ordering Party shall indemnify and save us harmless. 9.3 When using the installations, machines and other articles delivered by ourselves, the Ordering Party is obliged to painstakingly observe all safety regulations, technical rules, installation regulations, operating instructions and user manuals, and in particular all regulations applying to the electrical engineering field, and to allow only authorised skilled personnel to operate the equipment. 9.4. Any liability for damage caused by the installation or use of third-party components or replacement parts with our delivery items, which have not been verifiably and expressly recommended by us, shall be excluded. Client shall agree that Fronius International GmbH and its subsidiaries may collect, process and use personel data (such as name, address, email address), if applicable also by commissioning a service provider, for the purpose of sending information regarding products and services of any kind (e.g. by post, email, newsletter and more). A dissemination to externals in excess thereof shall not occur (excluded are legal or judicial obligations to provide information). The consent may be objected at any time in writing, in the newsletter there is also a link to unsubscribe. 11.1 The place of performance for deliveries, other services and payments, and the sole place of jurisdiction, shall be Wels, Austria. However, we shall also be entitled to go to law against the Ordering Party at the court which has “in-rem” and territorial jurisdiction under the relevant regulations for the Ordering Party’s commercial domicile or place of residence. 11.2 The Ordering Party is aware that in international commerce, it is common practice that an agreement regarding the place of jurisdiction can also be entered into, in a formally effective manner, as a result of tacit acquiescence or non-reaction to a confirmatory business letter such as an order confirmation note containing a pre-printed reference to the place of jurisdiction. The Ordering Party is familiar with this commercial usage, especially in the field of business of Fronius International GmbH, and heeds it regularly. 11.3 Legal disputes arising out of the contract are to be governed by Austrian law and by the commercial practice prevailing at the place of performance. The UN Convention on Contracts for the International Sale of Goods, on the other hand, shall not be applicable (Austrian Federal Gazette 1988/96). For software delivered together with other items or for software delivered separately (hereafter “software”) these Terms and Conditions of Delivery and Payment only apply insofar as these do not deviate from the following conditions or from conditions agreed upon separately with the Ordering Party. 12.1.1 All rights of intellectual property, such as copyright, trademark rights, design rights, patent rights, utility model rights and know-how, as well as in particular unprotected inventions, commercial experience, trade secrets and such like, independent from the time these were disclosed to the Ordering Party, shall be reserved at any time by us or our licensors. The Ordering Party shall have the right to use the software after payment of the agreed sum exclusively for his own purposes in accordance with the acquired number of licences. With the present contract only the authorization to use the software is acquired. Dissemination by the Ordering Party shall be excluded in accordance with the copyright law. With a possible participation of the Ordering Party in producing the software no rights other than the specified usage laid out in Section 12 are acquired. The Ordering Party may only use the software simultaneously on one device, which one is his decision. Usage of the software shall constitute any long-term or even any temporary duplication (copying) of the software, whether in whole or also only in part, by saving, loading, running or displaying for the purpose of execution of the software and processing of the data contained therein by the hardware. He shall not be authorized to copy the user manual. 12.1.2 The Ordering Party shall be permitted to make copies of the software for archival and data protection purposes on condition that there is no explicit prohibition in the software or any accompanying material (instruction manual, packaging, etc.) and that all copyright and proprietary notices are transferred unchanged in these copies. Retranslations of the programme code (decompilation) exceeding the legal provisions shall not be permitted. 12.1.3. If the software is equipped with technical copy protection, the Ordering Party shall in the case of damage be supplied with a replacement copy after restitution of the data carrier. In the event of availability of a new software version the Ordering Party shall be entitled to exchange the supplied software package for a similar software package of the new version at our listed update price; the exchange implies the software package as a whole, as it was acquired by the Ordering Party. With the exchange Ordering Party´s permission to use the exchanged software package shall expire. In such an event the Ordering Party shall immediately and completely destroy all copies, partial copies and backup copies as well as altered or revised versions of the software and the copies, partial copies and backup copies made thereof. 12.3.1 The Ordering Party shall note that it is not possible to develop software programmes in such a manner that these are free from defects for every application condition. 12.3.2 We shall warrant that the supplied software fulfils the agreed functions and has the expressly guaranteed properties. Requirement for any warranty is usage according to contract. A defect for which we are responsible shall only be deemed to exist if the software does not function according to the most recent version of the corresponding performance description/documentation and if this is reproducible by the Ordering Party. In order to carefully examine possible occurring defects the Ordering Party shall be obliged to support us in the rectification of any defects. 12.3.3 We further shall warrant that the original software is duly recorded onto a tested data carrier. Excepted here from are previously installed software and third-party software products. 12.3.4 Software defects shall be documented by the user and we shall be notified in writing with immediate effect; otherwise 8.3 shall apply. 12.3.5 The warranty period shall always be twelve months; the period commences with the dispatch of the software package. 12.3.6 If the software package is not usable or defect (12.3.2), we shall exchange it primarily for a new one of the same title or for an adequate alternative solution. If this also proves to be unusable or defect and if we are not in a position to make it usable with adequate effort within an adequate time, but at least within a period of four weeks, the Ordering Party may demand a price reduction or a change. Costs of defect rectification by the Ordering Party or a third person shall not be compensated by us. 12.3.7 In excess of this (12.3.6) we shall not provide warranty, in particular not in the case of the supplied software not meeting the special requirements of the Ordering Party or user, and also not for altered or revised versions of the software (point 12.1.2), unless the Ordering Party can prove that the defects are not connected to the alterations or revisions. The Ordering Party itself is solely responsible for the selection, installation and usage of the software as well as for the results intended therewith. 12.3.8 In the event of unjustified assertion of defects in the software we shall be entitled to charge the Ordering Party with any incurred costs according to valid cost rates. 12.4.1 All further claims of the Ordering Party or third persons, in particular claims for compensation for damages of any kind, shall be excluded, unless the injured party can prove that the damage was caused by us either intentionally or due to gross negligence. 12.4.2 Otherwise Point 9 shall apply accordingly. I have read and do accept general terms and conditions.